Thank you to all residents, businesses and organizations that have helped at the various community cleanups this year sponsored by the Volunteer Program. City parks, bike trails and hiking trails are kept clean and beautiful thanks to the efforts of our volunteers. Recent cleanups by 21 total volunteers along the Moraine bike trail and at Deer Meadow Park collected 180 pounds of litter and recycled cans. 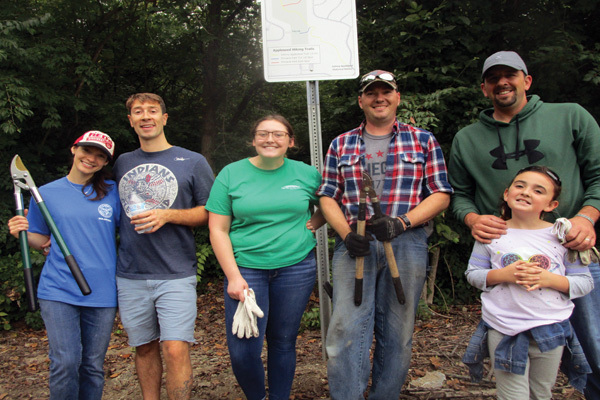 On September 22, eight volunteers hiked the Johnny Appleseed Hiking Trail and collected 80 pounds of litter, cut back overgrown branches and weeds, repaired three footbridges and built a new footbridge on the historic nature trail.